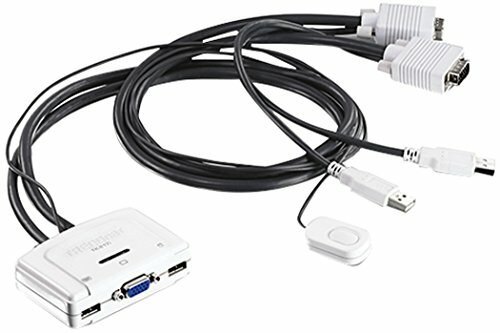 The 2-Port USB KVM Switch, model TK-217i, allows you to control 2 PC and/or Mac computers with one set of console controls. Manage laptops or desktops that have VGA and USB ports at the touch of a button, with a set of USB keyboard, USB mouse, and VGA monitor console controls. No driver installation required, simply plug in the devices to control 2 computers. A convenient toggle switch with a 1.5 m (5 ft.) extension cable can be placed in the most ergonomic location on your workstation. View high quality VGA resolution at up to 2048 x 1536 pixels. Built in 0.8m (2.6 ft.) combination cables include all the necessary USB and VGA connectors for each respective computer. This KVM switch does not need to be plugged into an outlet—it is powered by the connected computers. Download a Windows and Mac compatible utility to define Hot Keys and create Auto Scan intervals.